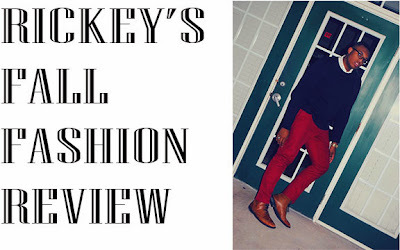 This is the first post of my Fall Fashion Review! I love Fall Fashion, it's my favorite time of the year! The transition from shorts and flip flops, to coats and boots is AWESOME! 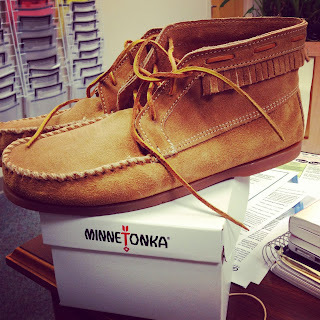 Today, I will be focusing on my brand new Minnetonka Chukka Boots! I have been wanting a pair of Minnetonka boots for the longest time! I finally decided to get myself some! I love shoes, and these are going to be some of my favorites, not just for Fall, but for all time! I've only had them for one day, but they are some of the best boots I've ever bought! I was kind of skeptical about them because I didn't think the sole was going to sustain, but all my myths were put to rest when I tried them on! The soles are very strong! I wouldn't usually go for a shoe like the Minnetonka, but I was feeling edgy, and decided to give them a try! I love the fact that they are so versatile! I can wear these with skinny jeans and a cardigan, or even with khakis and a polo! These boots are also very affordable, coming in around $60, you are getting EVERY penny worth of your money! Mine are the Taupe color, but they are also available in Black and Brown! I personally love the Taupe, because they go with so much in my closet!These classic and timeless shoes will probably become my favorite over this Fall and Winter Season! I love getting new pieces in my closet, because it always helps me reevaluate my closet, and help me look at some of my older pieces as well! I can't wait to bring in the Holiday Season in my new Chukka Boots from Minnetonka! Go ahead and order yourself a pair! You will definitely not regret it! What are you Fall Fashion Favorites? Let me know so I can try them out for myself!